Catch My Morning Jacket & Moon Taxi At Ascend Amphitheater Tonight!! It may be a wet one tonight friends, but, come hell or high water, My Morning Jacket is in Music City, and they are going to be melting some skulls tonight at the fabulous new Ascend Amphitheater. Tickets are still available, from $30 to $56, and don’t let the weather deter you because MMJ always puts on one hell of a show. Arguably one of the best Bonnaroo sets ever (2008), by them or any other band, was performed in the wet stuff, so we know they won’t be intimidated tonight. Local rising shredders Moon Taxi kick things off for you on a night that promises to be worth standing out in the rain for. Touring in support of their seventh full-length, The Waterfall, (amongst various other EPs, compilations and live albums), My Morning Jacket have risen from indie Southern psych rock favorites to mainstream festival headliners by doing it the old fashioned way; putting together one blow out performance after another. Known for their rowdy jam friendly live performances, and having a charismatic character for a frontman (Jim James), MMJ have been a staple at festivals almost since their inception in 1998, especially at Bonnaroo, where they’ve turnt it out as much, if not more, than any other band. We told you all about their ‘Roo set and Forecastle set that we’ve already seen this year, and now we look forward to seeing Jim and his homies bring the noise/fun to the relatively more intimate setting in Nashville. 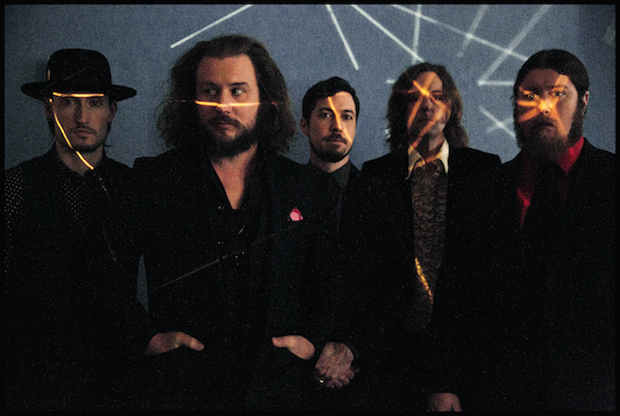 Don’t let a storm cloud rain out your parade, GO SEE MY MORNING JACKET TONIGHT, you won’t regret it. A local band we know, love and have written about many times before, Moon Taxi are five guys who’ve truly earned everything they’ve achieved so far. Since releasing their debut record, Melodica (2007), the band has been building a steady fan base in Nashville and abroad, thanks to their infectious brand of progressive indie jam infused rock tunes. Already headlining gigs at bigger venues (read this post), completely manhandling their last Live On The Green slot, and then totally destroying it during a day time slot at Which Stage at ‘Roo this year, MT seem poised to make a giant leap into the mainstream consciousness in the next year or so. Opening for MMJ certainly won’t hurt anyway, and with a new album, Daybreaker, set for an October release (pre-order it digitally here), expect to hear much more about one of our favorite local bands this year. My Morning Jacket and Moon Taxi will perform tonight at Ascend Amphitheater. The show is begins at 7 pm (doors at 5) and will go on rain or shine. The show is all ages and tickets are still available for $30-$56.